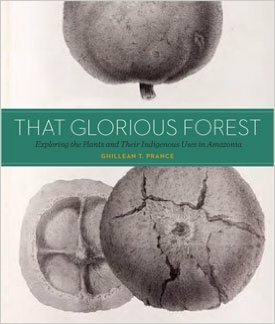 There’s no denying that Sir Ghillean Prance FRS is one of the most distinguished tropical botanists alive today. His contributions to the scientific literature have been immense, particularly regarding the floral biogeography of Amazonia, not to mention numerous taxonomic identifications and specimens distributed in herbaria throughout the world. 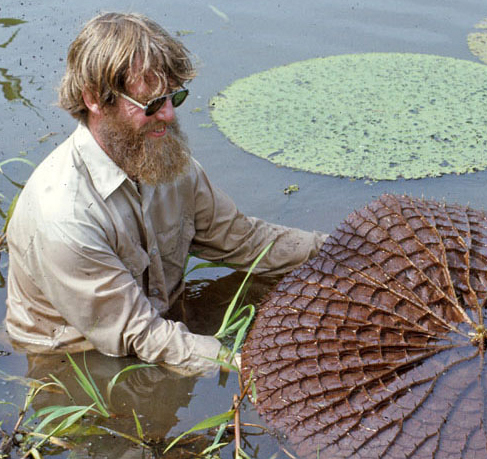 For over ten years he was the director of Kew Gardens, one of the foremost centres of plant research and discovery. Moreover, he has conducted 56 expeditions to South America over a long career, with recollections of these forests and the societies contained within them that date back before the incursions of the modern world. His is a story which deserves to be told. I love reading the memoirs of the great exploratory botanists*. The hardships they willingly accepted in pursuit of plants are an inspiration, along with the thrill of true discovery at a time when so many parts of the globe could only be reached through daring exploits. I’ve been on my fair share of remote expeditions, but in these days of long-haul flights, widespread airports, tarmacked roads and satellite phones, the challenge is now more one of escaping modernity than coping without it. Reading the exploits of our predecessors, before health and safety became the deadening preoccupation of adventurers, is a refreshing antidote. With such easy material, combined with abundant photographic records, Prance could hardly fail to produce an engaging account of his career in the tropics. And yet… it’s not written in the most gripping style. The opening chapters of That Glorious Forest read something like a school pupil’s summer diary, dominated by mundane observations interspersed with trivial details and almost entirely stripped of the passion and enthusiasm that must surely have driven his work and made such hardships endurable. To take one incident as an example, Prance once found himself spending the night in a jail cell in a remote border town. The potential for a ripping yarn gets even better, as he only ended up there after a fraught flight across the Amazon forest in a dilapidated DC-8 during which first one, then the second engine failed, necessitating an emergency landing. Stranded in a small town with little accommodation, the only place to house them for a night was the local jail. This story would be gold to a biographer. Yet we are told nothing about the reactions of the people on the plane, their emotions, the responses of the people on the ground. Were there prisoners in other cells at the time? How well did everyone manage to sleep? Instead we are told only the sparest details, a plot outline instead of a hair-raising adventure. For once I found myself longing for more information rather than less. What remains isn’t so much an absorbing account of derring-do in the name of science, but a much-condensed summary, combined with a desire to name and thank everyone with whom his path has crossed. The latter is noble, even endearing, but the general reader gains little from it. As I can vouchsafe from my own expeditions, the most entertaining stories usually derive from the more unpleasant people one ends up encountering, and the same is true here. If you’re looking for peril, it’s most often associated with a botanist’s greatest fear: plant presses catching fire. The potential loss of hard-won specimens is what keeps any field collector awake at night. I appreciated the details of the plants collected and the stories behind them — these are among the best bits, often infused with emotion. A botanist to the end, each chapter concludes with the accession numbers of all specimens collected over the course of the events described, along with the type specimens for all new species discovered. This makes up an impressive tally. As for the adventures themselves, I began to gain the impression that each expedition had been described in the manner of a botanical specimen, each inflorescence reduced to a floral formula; flattened, dessicated and inspected for its features alone. Having never met Prance, I have no idea whether this is typical of either the man or his attitude to life, but given how keen I was to enjoy this book, I was disappointed by the dry writing style. A telling comment appears halfway through, in a passing remark about having met the author Redmond O’Hanlon, whose tales of travels with the Yanomani of Venezuala are one of the great accounts of this region. “I commented that I would be really ashamed to run an expedition like that, but that as a writer, he had to have so many misfortunes to make a good story!” This seems doubly unfair, as there are no shortage of mishaps in Prance’s own travels, but also because these do not in themselves make for a readable account. The photos and illustrations throughout are wonderful, and the production quality is excellent, making it great value for $69. It’s not meant as a coffee-table book though, and therefore doesn’t quite fit that niche either. That said, there are some genuinely interesting anecdotes. A field trip to collect fruitflies with the great geneticist Dobzhansky was enlivened by his insistence on carrying mashed bananas all the way across Brazil to the Yanomani, whose staple crop is… bananas. He appears to have been a demanding and eccentric guest, though is thought of affectionately enough to be called ‘Dobbie’ throughout. Some of the best passages involve Prance’s encounters and working relationship with forest-dwelling people. On meeting the Yanomani: “They were curious about us and were stroking my hairy arms and chest, making their clicking noises of appreciation. When they wanted to see more, I just stripped completely and their curiosity was satisfied.” If this sounds strange, then it’s worth remembering that the Yanomani spend their lives naked. One of the fungi they eat translates as hairy-arse fungus. Elsewhere there are intriguing ethnobotanical observations, whose value is underestimated by the modern scientific literature. For example, the Mak\’u people use the milky sap of a fig species (Naucleopsis mello-barretoi) as a poison for blowpipe darts. The toxin is a cardiac glycoside, only known to occur elsewhere in another genus of the Moraceae, and only in New Guinea — where the natives have similarly discovered its utility as a hunting poison. If you want to read a book documenting the ethnobotany of the neotropics, and the efforts of bold scientists to describe it, then Wade Davis’ magnificent memoir One River still leads the way. It is informed by his own personal account of travels in search of plants, interspersed with anecdotes and partial biographies of the legendary botanist Richard Evans Schultes and his distinguished student Tim Plowman. It’s a book which, had I read two decades earlier, would have changed the whole trajectory of my career. Schultes never wrote up his own memoirs, while Plowman died tragically young; it took Davis to transform the raw materials of their lives into an appealing narrative. Letting the human story drive the text only served to increase the thrill of the botanical chase behind it. By the end of That Glorious Forest I couldn’t help wishing that Prance had taken a similar approach. * My next challenge is reading another memoir by a living legend of tropical taxonomy, this time from the Orient — Peter Ashton’s mammoth On the Forests of Tropical Asia. It’s 800 pages long and weighs a tonne though, so don’t expect the review to follow any time soon. This entry was posted in Uncategorized and tagged book review, botany, forests, history of science on January 13, 2016 by Markus Eichhorn.